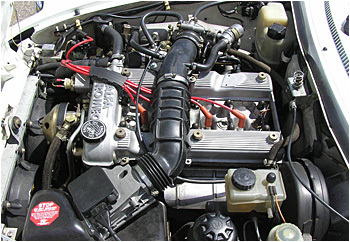 Beginning in 1982 for the Spider, and 1981 for the GTV/6, Alfa adopted Bosch L-Jetronic fuel injection. The heart of this system is the airflow meter, which measures the amount of air being required by the engine. Hence the name L-Jetronic; the “L" stands for “luft", the German word for air. In 1990 Bosch Motronic fuel injection replaced L-Jetronic on the Spider and 164 models. While the general operating principles are the same, Motronic offers more precise control over fuel and ignition events. Gasoline is supplied to the injectors by an electric pump. Two pumps are used on Spiders, one submerged in the tank, and one under the car in front of the tank. The pumps are controlled by the combi-relay. This relay is in turn switched on and off by a microswitch attached to the air flap inside of the airflow meter. At the end of the injector rail is a fuel pressure regulator that maintains constant fuel pressure. The regulator detects engine load by sensing manifold vacuum, and returns the unused fuel back to the tank. The injectors themselves are simply solenoid valves aimed at each intake port. They're either on or off, so the amount of fuel injected is determined by the length of time they're energized (called the "pulse width"; a typical range is 1/7,000th to 1/1,000th of a second). The electronic control unit provides the high-speed ground that completes the circuit to the injectors. It determines the span of open time that will result in the ideal mixture for the particular conditions, based on the input from various sensors. The most important of these is the air flow meter, which is mounted between the air filter and the throttle plate. Info on operating temperature, rpm and exhaust gas oxygen content is also critical for accurate fuel metering, and is provided by the temperature sensor, the ignition pickup, and the oxygen sensor, respectively. An extra injector, the cold start valve, provides extra fuel into the manifold for starting. It is controlled by the thermo-time switch, which senses coolant temperature. The auxiliary air valve admits extra air during warm-up to provide decent idling. This is a short guide to some common causes for a no-start condition. It is not a complete listing or a substitute for a proper shop manual. Voltage. One of the design parameters of the L-Jetronic system is that there must be 10 volts on the #10 pin connector at the ECU for the car to start. If there is less than 10 volts, the ECU shuts off. This requires a very good battery because the electrical load during starter cranking can cause the voltage to drop below 10 volts at the #10 pin. Check your battery condition and battery/ground connections first. Once you’ve determined that the battery and battery cabling are in good shape, try the following. From the #10 pin at the ECU connector, trace back into the harness (green/black wire) as far as possible. You will need a couple inches of wire. Cut the wire and tape it off going into the harness. Now, locate the main power relay next to the ECU. It has a large gauge red main power wire going into it. Take the wire from the #10 pin on the ECU and attach it to connector #87 on the main power relay. This provides more voltage to the starting circuit. Fuel Pump Power. The combi-relay (GTV/6 and Milano) or the fuel pump relay (Spider) is the most common failure item in the L-Jetronic system. To test, unclip the airflow meter from the air filter housing. Turn the key to the “on“ position, reach inside the airflow meter, and gently push the flap open. The fuel pump should click on, accompanied by the sound of fuel rushing through the fuel rail. If this does not happen, check the fuel pump fuse. If the fuse is intact, the culprit is most likely the combi-relay. On V6’s, the combi-relay is on the firewall, and the fuel pump fuse is in the fusebox. On Spiders, the fuse and relay are under the package shelf, behind the seats. Cold Start Valve/Thermo Time Switch. The cold-start valve is supposed to supply a very rich mixture upon initial start up when cold. To test it, remove the cold start injector from the intake manifold, place the nozzle in a container to catch the fuel, and turn the key to the start position. With the temperature of the engine below 95 degrees, it should spray. If not, check for voltage at each of the two terminals on the injector with the starter activated. If one terminal has voltage but the other doesn’t, replace the cold-start injector. If both terminals have voltage, check the wiring between the cold-start injector and the thermo-time switch. If the wiring is OK, replace the switch. If neither terminal has voltage, repair the wiring harness between the starter solenoid and the cold-start injector.